Two shows only – book now! Celebrate the festive season with a little Varietease! An action-packed variety show, over two nights! 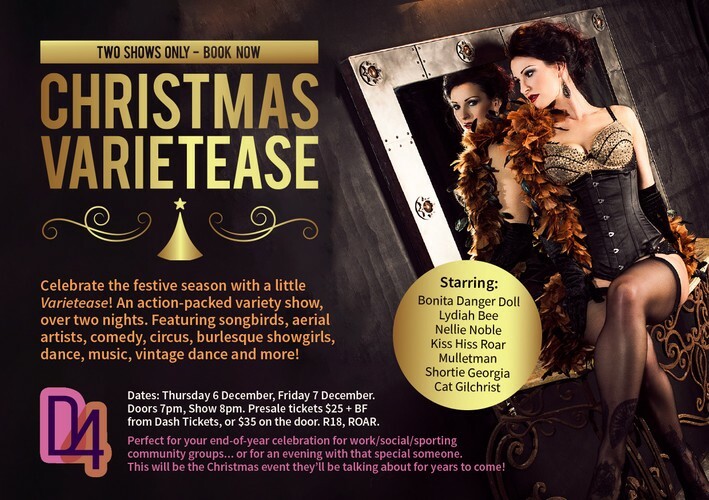 Featuring songbirds, aerial artists, comedy, circus, burlesque showgirls, dance, music, vintage dance and more! Doors open 7pm / Show starts 8pm. Presale tickets $25 + booking fee from Dash Tickets or $35 on the door. Perfect for your end-of-year celebration for work/social/sporting/community groups… or for an evening with that special someone! This will be the Christmas event they’ll be talking about for years to come!